Square Roots Productions’ debut spring season at the Green Note in Camden Town ended on a high note with an evening of outstanding music which exemplified the charity’s mission: to showcase both legacy artists while also offering a platform to new talent. Bonnie Dobson and Harry Phillips were the perfect fit. And as a Canadian singer-songwriter whose recent forebears hailed from Scotland and Ireland and who played the folk clubs of Denver, Los Angeles, Chicago and, of course, New York’s Greenwich Village in the 1960s before settling in London more than 40 years ago, Bonnie is also the most perfect exemplar of SRP’s Bringing It All Back Home project, as this recent interview for the Ham & High shows. The project celebrates the music which left these islands in centuries past and fetched up on the shores of Canada and America, toing and froing across the Atlantic ever since. Our ‘special relationship’ is a musical one. The concert, on 13 April, was a sell-out – Green Note’s intimacy is great but demand for tickets way exceeded supply – and the atmosphere was electric, attracting fans from as far afield as Belgium. Singer-songwriter Harry Phillips opened the show, offering a preview of his debut album, English Americana. As on the album, he was backed by Alex Tinlin on keyboards and Simon Treasure on drums and percussion: a talented trio who surely made new fans. Harry’s set included ‘Back Around’, ‘Time Out Don’t Phase Me’, ‘Half Light’ and ‘Coming Home’, a beautiful and touching song written for his mother. Acknowledging the roots of Bringing It All Back Home, he closed his 45-minute set with ‘Trying to Get to Heaven’ by Bob Dylan, a song from his acclaimed 1997 album Time Out of Mind. The performance (the band was pared down for the occasion) revealed a talented singer and guitarist, Harry swapping between his beloved Martin and Fender and perfectly in sync with his fellow musicians. The three can also be heard on the new Tinlin CD, Strangely Blue. Catch Harry now and see him on the way up: English Americana is officially launched on 4 June with a concert at Haresfoot Brewery in Berkhamsted. Bonnie opened her set with a tipping of her metaphorical hat to the sixties solo years, ‘before I acquired my Bens’, a reference to guitarist Ben Phillipson and fiddle player Ben Paley, whose father Tom Paley (folk royalty) was in the audience. She offered three songs: ‘Long River’, a Canadian song; ‘Dear Companion’, from among the songs collected in the Appalachians by Cecil Sharp; and ‘The Klan’, an extraordinarily chilling song from the early 1950s, featured in Sing Out, variously credited to Alan Grey and Alan Arkin. The songs showed off her magnificent voice to perfection and it didn’t take much imagination to be transported back to another time and another place. Then it was time for her ‘Boys’ to join Bonnie on Green Note’s tiny stage – those two Bens, plus bassist Tali Trow – for a musical journey (replete with anecdotes) that spanned her remarkable career and revealed the breadth of her skills as a songwriter. The set included ‘Peter Amberley’, a traditional song from Canada’s Maritime Provinces which, in the early 1960s, inspired a young Bob Dylan when he came to write the melody for ‘The Ballad of Donald White’, as well ‘V’ Le Bon Vent’, an Acadian song learned when the teenage Bonnie was a camp counsellor working children’s camps in Ontario and Quebec. It was an utterly captivating performance of light and shade, including many of her own songs: the fun and flighty ‘Come on Dancing’, the powerful and poignant ‘Who Are These Men?’, the ‘gently psychotic’ ‘Winter’s Going’, a favourite of Jarvis Cocker; and, of course, ‘Morning Dew’, written back in 1961, her first song, widely covered, and sadly still all too relevant. It was a mesmerising performance which left the audience calling for more, despite the 11pm curfew. Check out Bonnie Dobson and Her Boys at their 8 May gig at the Apple Tree in Clerkenwell, London and on 10 June at the Kalamazoo Klub at the King’s Head in Crouch End. And don’t forget the new album, Take Me For a Walk in the Morning Dew, now also available as a limited edition LP. Alchemy took place at the Old Queen’s Head in Islington’s Essex Road last night (24 February) when Bonnie Dobson joined Jim Kweskin for a Sam Lee Nest Collective special showcasing Hornbeam Recordings’ burgeoning catalogue. You didn’t need to close your eyes to be transported to Greenwich Village – or perhaps Harvard Square ­– in the 1960s. Wasn’t that a time! How fortunate, for those of us who were the wrong age and in the wrong place to experience the rich fruits of the American folk revival first time round that both artists are in such fine form, happy to josh about their long-ago exploits and allude modestly to their own illustrious pasts while sounding so fresh and of the moment. To see two performers so totally at ease with themselves and with their audience and who wear their talents so lightly makes for a very special evening indeed. Bonnie apologised for any limitations, explaining that she had the flu, which she treated with a cocktail of port and brandy, ‘a north country remedy’ apparently which you feared might send once-remembered lyrics floating off into the ether. Not a bit of it! In the first couple of songs – ‘I Got Stung’ and ‘Southern Bound’, both from her new album – she seemed to be holding back a little vocally but soon her voice unfurled in all its glory. Undiminished by the passage of time, Bonnie’s range embraces both a warm alto and an exhilarating soprano. A thrilling instrument indeed. Backed by ‘Her Boys’, Ben Paley on fiddle and Ben Phillipson on guitar, she treated the audience to an hour-long set of songs from across continents and across years, interspersing them with vignettes from her life in Canada, in the United States and in Britain, where she’s lived since 1969: ‘V’la L’Bon Vent’, ‘Everybody’s Talkin’’ and ‘Dreams’, in which she sings ‘you can always go home again but you can never go back’. There was gentle humour (‘Squadron Leader’, written during the 1970s, when she toured British bases with the likes of Mike Harding and Wally Whyton) and understated wisdom (‘Don’t Look Down’ and ‘Sing Your Song’) and, of course, ‘Morning Dew’, the first song she wrote way back in the early 1960s and which was effectively stolen from her. ‘It hasn’t got any better, has it?’ she observed, before singing this gentlest of songs about the horrors of a nuclear winter. Coincidentally, it was almost 50 years to the day since Bonnie and Jim Kweskin last shared a stage, at the Ontario College of Art for a recording of the TV show Let’s Sing Out, Canada’s version of Hootenanny. 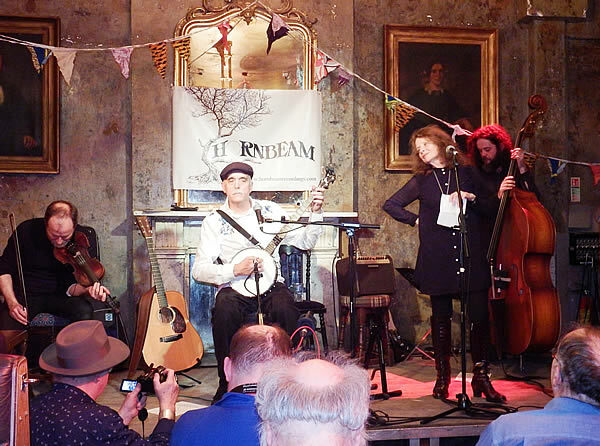 Backed by Ben Paley with Talli Trow on string bass, Jim too was in fine form, though he joked endlessly about the creakiness of older age and observed that the folk revivalists played for ‘old people and their parents’. Now 75 and on his first ever visit to Britain, he offered a set that dug deep into Harry Smith’s Anthology of American Folk Music, with songs such as ‘Down on Penny’s Farm’, ‘The Coo-Coo Bird’ and ‘The Wreck of the Tennessee Gravy Train’, a song from the 1930s about how bankers and politicians wrecked the economy that remains as topical today as when Uncle Dave Macon recorded it in 1930. In a set laced with irony and humour, Pat Donahue’s reworking of the old Bing Crosby classic caused particular merriment: ‘Do you like to play the guitar/Take your money home in a jar/From a coffeehouse or a bar/Or would you rather get a job?’ Each song was carried aloft by expert fingerpicking on guitar and, occasionally, a banjo borrowed from Tom Paley, who was in the audience. There were moments when Jim’s voice recalled Willie Nelson. To close, he brought Bonnie back on stage for what he called ‘one of yours’. It turned out to be Donovan’s ‘Colours’, with which the audience – which also included Joe Boyd – seemed entirely familiar. Bonnie’s harmonies floated bell-like above it all. Forget the Brits, happening across town – this was real music by real musicians. It was a magical evening. In the New York Times of 28 February 1962, music critic Robert Shelton wrote of a new talent, a titian-haired young woman down in New York City from her native Toronto. He was mesmerised by ‘her distinct, true-pitched singing in a firm sweet soprano’ and by her ‘honesty and warmth’ on stage. The singer was Bonnie Dobson, and she had already toured with Sonny Terry and Brownie McGhee and Lightnin’ Hopkins, having been talent-spotted while a student at the University of Toronto. Her first ‘proper gig’ was on 6 May 1960 at the Exodus Club in Denver, Colorado where she was earning $125 a week – a fortune in those days. For a few years, she never looked back, basing herself first in Chicago and then in New York’s Greenwich Village, crucible of the folk revival. It was while playing at the Ash Grove in Los Angeles that a late-night conversation about the horrors of a nuclear winter (it was the height of the cold war) led Bonnie to start scribbling her first song. Unsure as to its qualities, she sang it down the phone to a friend, who pronounced it ‘all right’ so she sang it the next night at the Ash Grove. ‘Morning Dew’ featured in her set at the 1961 Mariposa Folk Festival and she recorded the song for Broadside Magazine in 1962 (it was released in 2000 on The Best of Broadside 1962-1988). It was showcased again when she played Gerde’s Folk City, the Greenwich Village club that was the launch pad for so many talents, not least Bob Dylan, and it featured on the live album Bonnie recorded at the club. An anti-war classic, ‘Morning Dew’ has since acquired cult status, recorded first by Fred Neil, then by Tim Rose, who changed some of the lyrics and claimed a co-writing credit to which he was not entitled. Eventually Bonnie would fight a legal battle to wrest rights and royalties back. Meanwhile, ‘Morning Dew’ became something of a signature song for the Grateful Dead, who introduced it into their repertoire at the Human Be-In in San Francisco’s Golden Gate Park in January 1967, and it was covered by the Allman Brothers, Jeff Beck, Nazareth, Devo, Lulu and Robert Plant, with whom Bonnie sang it at a Bert Jansch tribute concert in London in 2013. The third of three children, Bonnie’s father was a union organiser. She remembers going to see the great Paul Robeson in concert when she was 13 years old and, even earlier, when she was 10, a class teacher introduced her to the Weavers, further piquing her interest in folk music. ‘I guess I was about 12 and Pete Seeger came up to Toronto to give a concert,’ she told Rock and Reel. ‘That was the first time I’d heard him. I’ve never known anyone connect with an audience like he did. At the end he asked for requests and I said could you sing “Come All Ye Fair and Tender Maidens”? He looked at me and said “You’re too young to know about that!”’ Adding a couple of years to her age, she managed to get a job at Camp Beaver, a summer camp for kids which was next door to an adult camp where, every Saturday, folk singers, including Seeger, would come up from the States to give a concert. By the time Bonnie was into her teens, she was steeped in folk music and it was folk music promoter Marty Bochner, whose kids she babysat, who made the introductions which led to that first US tour. The Anglo-American folk revival was in full swing. In banning Pete Seeger and his confrères from the airwaves, Senator McCarthy had driven them into the summer camp, where a whole generation of kids had – like Bonnie – discovered folk music, many learning to play guitar and five-string banjo (the latter Seeger’s special mission). The Village – always ‘the Village’, never Greenwich Village to those who lived there – was a perennial bohemia but in the early sixties when Bonnie arrived it was very special. As Janis Ian has said: ‘The musicians and artists who gravitated toward Greenwich Village through the sixties and even into the seventies formed a group as diverse, eclectic and talented as the artists who gravitated to Paris in the early 20th century. Their influence on our culture, and that of the world, cannot be over-estimated’. Bonnie settled in to an apartment (shared with folk and blues singer Judy Roderick) on St Marks’s Place, a few blocks from Washington Square Park and the surrounding clubs which together formed the crucible of the folk revival. Everyone passed through Gerde’s, but other clubs included the Gaslight, the Kettle of Fish, the Café Wha? and the Bitter End. A few more blocks west, near the Hudson, the White Horse Tavern (immortalised in the song ‘Those Were the Days’) was a late-night gathering place, an old longshoreman’s bar where the Clancy Brothers hung out and to where Robert Shelton would lead late-night drinking parties that (as Suze Rotolo recalls in her memoir A Freewheelin’ Time) often ended up back at his apartment on Waverly Place. Further along that street the Hotel Earle (now the Washington Square Hotel) was at various times home not just to Dylan and Joan Baez (who immortalised it in ‘Diamonds and Rust’ ) but to Jack Elliott, Roger McGuinn and John Phillips who, on a frigid New York day, wrote ‘California Dreamin’’ in his room there. It was, Bonnie recalls, ‘an extraordinary time’. Bonnie’s extraordinary voice was captured on a small handful of albums which have long been sought after by collectors. The first two, She’s Like a Swallow and Dear Companion, have now been reissued on CD by ACE Records and it’s hoped the others will follow, including the seminal At Folk City. Her new album, Take Me For a Walk in the Morning Due, released by Hornbeam in 2014, reveals a voice as magnificent and exciting as ever, undimmed by the passing years. Small wonder it was hailed as the comeback of the year. This time she’s here to stay. New York folk legend Bonnie Dobson, a key figure in the 1960s’ revival whose song ‘Morning Dew’ is now a classic, covered by Fred Neil, the Grateful Dead, Jeff Beck and Robert Plant among others. She is supported by Harry Phillips, another new talent to watch.